Applying multimedia to Wireless Sensor Network (WSN) adds more challenges due to WSN resource constraints and the strict Quality of Service (QoS) requirements for multimedia transmission. 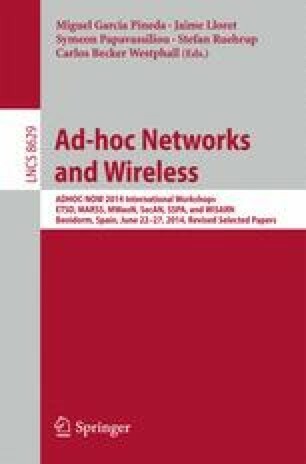 Different multimedia applications may have different QoS requirements, so routing protocols designed for Wireless Multimedia Sensor Network (WMSN) should be conversant of these requirements and challenges in order to ensure the efficient use of resources to transfer multimedia packets in an utmost manner. The majority of solutions proposed for WMSN depends on traditional layered based mechanisms which are inefficient for multimedia transmission. In this paper we propose a cross-layer Ant based Routing Protocol for WMSN (CARPM) by using modified ant colony optimization (ACO) technique to enhance the routing efficiency. The proposed protocol uses an improved ACO to search for the best path that are satisfied with the multimedia traffic requirements. While making best decision the weightage is given to energy consumption, and queuing delay. The proposed cross layer scheme works between the routing, MAC, and physical layers. Since, the remaining power and timestamp metrics are exchanged from physical layer to network layer. Dynamics duty cycle assignment is proposed at MAC layer which changes according to traffic rate. The presented algorithm is simulated using NS2 and is proven to satisfy its goals through a series of simulations. The authors wish to express sincere appreciation to Universiti Technology Malaysia (UTM), Malaysia for their support and special thanks to researchers at Center of Excellence in Information Assurance (CoEIA), King Saud University, Kingdom of Saudi Arabia. The authors would like to thank the anonymous reviewers for their helpful suggestions.